100% Malbec grapes sourced from family-owned, 100 year old vines from the La Florencia vineyard in Lujan de Cujo, Mendoza. The wine is fermented in their high-tech winery before ageing in French and American oak barrels for 6 months. 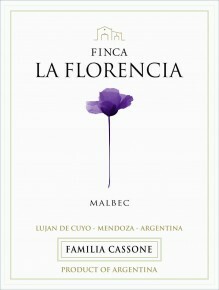 La Florencia Malbec is full-bodied red that offers intense fruit aromas of blackberry and cassis and some floral notes. Upon tasting, delicious flavors of blackcurrant, plum, dried herbs and raspberry are revealed, continuing onto the palate with a smooth, dry finish. A round red with medium body which will match perfectly with any meat dishes. Harvested by hand in small crates. Traditional vinification with cool maceration in stainless steel tanks. Aged for 6 months in French (80%) and American (20%) oak barrels.